Excellent airtightness tests have been carried out on a Polarwall constructed house by Energist UK Limited, experts in air and acoustic testing. Sarah Fenwick at Energist commented "the readings we obtained were outstanding, our company has never before seen results like this", Sarah continued " normally our best readings come from SIP built houses but the Polarwall construction has eclipsed even this"
Chris Bowditch, who heads up L2P Testing, has also experienced the fantastic performance of the Polarwall product. 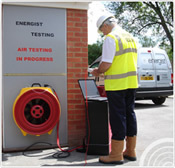 L2P Testing have carried out tests on a residential development in Wiltshire. Chris commented on the findings explaining "the results obtained were at least 50% lower than the best of the all the other construction types we have tested" Chris added, " Polarwall is clearly a product that will provide a huge benefit to the developer and contractor when trying to make their way through the minefield of air testing compliance"